When I first saw the latest media attack on fundraising by, you guessed it, the Daily Mail (never! ), lambasting JustGiving for charging charities for the service they provide (that’s a slightly rhetorical way of encapsulating the thrust of the Mail‘s attack but still basically what they did), I thought JustGiving were in for an uncomfortable day being hung out to dry and fending off repeated media attacks on their ownsome. So it was totally fantastic that there was such a bottom-up groundswell of support for JustGiving, with fundraisers spontaneously (so it seemed – though perhaps JustGiving’s comms team was working furiously in the background) tweeting and blogging their support. The Mail’s attack (a pejorative word I’m consciously using rather than a neutral term like ‘article’ or ‘investigation’) raises again serious questions and issues for the fundraising profession that we are again struggling to answer. Why were we supporting JustGiving? One fundraiser said on Twitter that he was slightly concerned about the “unconditional praise” that was being heaped on JustGiving, since their model might be detrimental for some charities, though that ‘unconditional’ praise could have been because the attack was also unconditional. 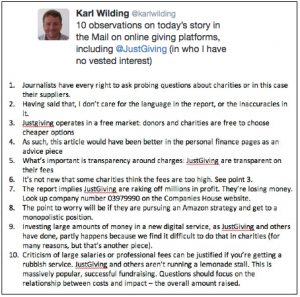 Some of JustGiving’s competitors (whom I shan’t name) crawled out of the woodwork in an attempt to make competitive capital out of JG’s travails by positioning themselves as a more transparent or ethical option. Again, as I said, I can’t reliably discriminate between the various digital giving platforms available to charities since I don’t use them. However, what I would offer in this context is that if you can’t give away something that people are happy to buy from someone else, perhaps you need to look at the quality of your product rather than moaning that the successful product costs more than yours does. 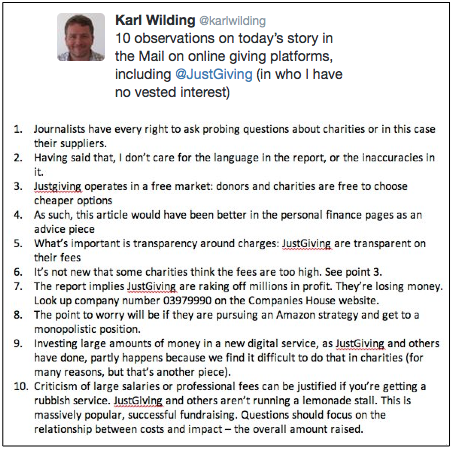 A caveat to this is that NCVO’s Karl Wilding (@karlwilding) pointed out that as JustGiving is actually losing money, he hoped this didn’t indicate an ‘Amazon’ strategy to deliberately undercharge in order to drive competitors out of the marketplace. While fundraisers were more than ready to say that JG did a great job and was worth the money they paid for the service, I think the support JG received has wider implications than this (incidentally, Karl Wilding also Tweeted an almost perfect rebuttal of the Mail’s attack – click on image). I suggest that the defence of JustGiving against the Daily Mail is less about defending what JustGiving does, and more about standing together with JustGiving to present a united front against yet another spiteful, ideological attack on the fundraising sector. The Mail’s piece wasn’t an isolated investigation into a part of the charity sector that they got wrong because they hadn’t quite grasped the nuances. Rather, it was part of a concerted, ideological attack on charities – particularly the way they raise money – that has been going on its current form for the best part of two years (at least). I’ve been shouted down before for saying that the sector is under attack from the media or that their position is ideological (the counter-argument being that this is just the everyday workings of the Fourth Estate and nothing untoward). But the nature of many (if not most) of the media attacks (not to mention some political criticism and regulatory activity) is so clearly ideological that I’m beginning to think that those who can’t see this must be in some kind of denial. 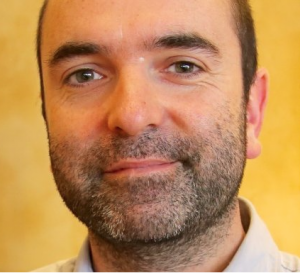 Matt Collins’ IoF blog satirically compares JustGiving to Bosch washing machines and rhetorically asks whether the Daily Mail would throw its shorthand notebooks out of its pram if it discovered Bosch was stealing money from customers to pay the salaries of washing machine engineers. And that identifies the real nub of the problem, because some people, including those who read and write for the Daily Mail, just will not countenance charities doing things they are perfectly comfortable with companies doing. A lot of people think the charities ought to have a different set of values (and therefore act differently on those values) to commercial organisations. That is an ideological position. And it’s something we as a sector we have never developed a convincing response to. In a blog on Civil Society about the Mail-JustGiving issue (in which he argues the Mail got it wrong), David Ainsworth (@daveainsworth4) says there is an “understanding gap” between charities and public – which is true, but to anyone who’s only just realised this, I’d ask if you’ve really been paying attention for the past 15 years. He then says that it’s the responsibility of fundraisers to make themselves understood (also true). Ainsworth argues that if the Daily Mail’s readers already knew about JustGiving’s remuneration processes, then the Mail’s story wouldn’t have passed the ‘so what?’ test and would never have been printed. The point of the story was therefore to provide its readers with information those readers didn’t already have (although those DM readers who use JustGiving almost certainly do know that). That would only be the case if the gap really were simply one of understanding – a gap that facts, such as facts about how JustGiving charges charities, can fill. While it is true that there is an ‘understanding gap’ between charities and the public, far more problematic is that there is also an ideological gap. This gap cannot be filled simply by throwing more facts into the hole and hoping people on the other side of the gap will take them up. That’s because the ideological gap is not about facts, it’s about values. The charity sector has a set of values about how charities ought to be run; some members of the public (possibly, though by no means certainly, those who don’t hatibually give to charity) and the media (and some regulators – most recently exemplified by the ICO’s stance on wealth screening) have a set of values about how charities ought to be run: at least some parts of those two sets of values are mutually incompatible. The reason the Daily Mail ran this story was not because its readers don’t know how JustGiving makes its money (facts), but because the Mail knew its (non-giving?) readers would not agree about how they did it (values). The Mail ran with this story not to provide its readers with information, but to validate their values. Fundraisers could have already been religiously following Ainsworth’s advice so that everyone already knows how and why JustGiving charges for their services, and the Mail could, and probably would, still have run a story about how terrible this is. We’ve seen this time and time again with the repeated media stories about street fundraisers. 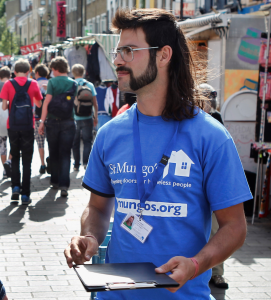 ‘Chuggers’ should have failed the media’s ‘so what?’ test years ago, but they keep resurfacing every year because the media’s concern is not about the facts of street fundraising, but the values of street fundraising. The understanding gap cannot be closed with shared facts unless the ideological gap can also be closed with shared values, which is something I’ve previously written about on Critical Fundraising. I’ve spoken before about ways to do this, which I won’t spend much time repeating again here, but would urge you to look at the three blogs I wrote on Critical Fundraising about this time last year (see links at foot of the page). But a core part of how I say the sector ought to respond is to develop its own ideological counter-narrative that it can advocate confidently and coherently, rather than simply trying to rebut the ideological narratives perpetrated by the likes of this week’s Mail attack on JustGiving. That means we have to talk about our values and why we think they are the right values, even if that means we need to say we think their values may sometimes be the wrong ones. Would fundraisers be prepared to be this ballsy? 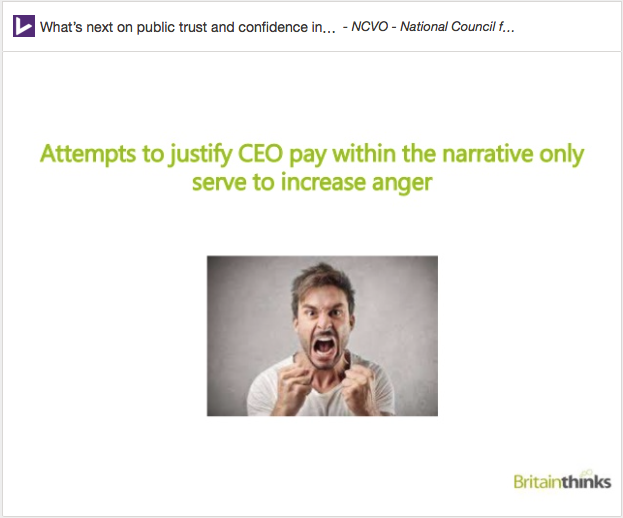 Last year, NCVO carried out some focus group research with members of the public to inform the development of its new charity narrative. Among other things, this predictably revealed that some people don’t like high ceo salaries, and attempts to justify such high salaries only served to increase the participants’ anger. They didn’t like chuggers either – “should not be tolerated”. The first sentence is right – you can’t fix reality by talking about an ideal. We probably can’t change people’s minds about ceo salaries and street fundraisers by talking about how charities need to pay attractive salaries and ask people for donations on the high street, because if that could be done, it would have happened by now. 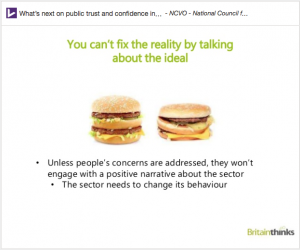 So NCVO’s solution is to not even try to change opponents’ negative attitudes about these things. NCVO’s solution is to change our behaviour so the object of their negative attitudes is no longer there. People don’t like high ceo salaries? Fair enough, we won’t pay them. People find street fundraisers intolerable? Righty-ho then, we won’t use them any more. NCVO’s solution to a clash of values between proponents of certain nonprofit values (such as having the best talent to fulfil the mission, or fundraising effectively and cost-efficienly) and those who object to how these values are enacted (‘high’ ceo salaries and street fundraisers), is to adopt the values of the opponents (people ought not make a lot of money out of working for a charity; charities ought not fundraise in a way I don’t like) and to stop doing those things. 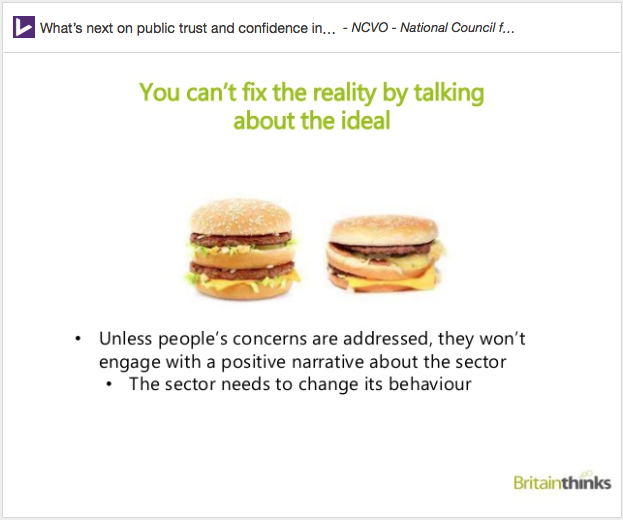 And all so that people with negative attitudes towards these sector values can “engage with a positive narrative”. Rather than construct a narrative about charities that challenges doubters to think differently, we dilute our values until no-one can any longer take offence at them. That doesn’t sound like ideological advocacy to me. That sounds more like ideological surrender. If we are to make the pubic ‘understand’ us, to engage with critics and try to win them round to our values, we need to be able to confidently stand up for those values – and how we act on them – not be embarrassed by them or pretend they don’t exist, just to get an easy life. That’s why this week in the face of an ideological attack, we are all JustGiving. Before Christmas, we were all British Heart Foundation and RSPCA. In the summer of 2015, we were all the fundraising directors whose Facebook profiles the Daily Mail raided (journalists, or course, being exempt from the Data Protection Act 1998). Next month we’ll all be the organisation that is next off the rank for an ideological kicking from the Fourth Estate. But this week, I am JustGiving*. *Other online giving platforms are available. 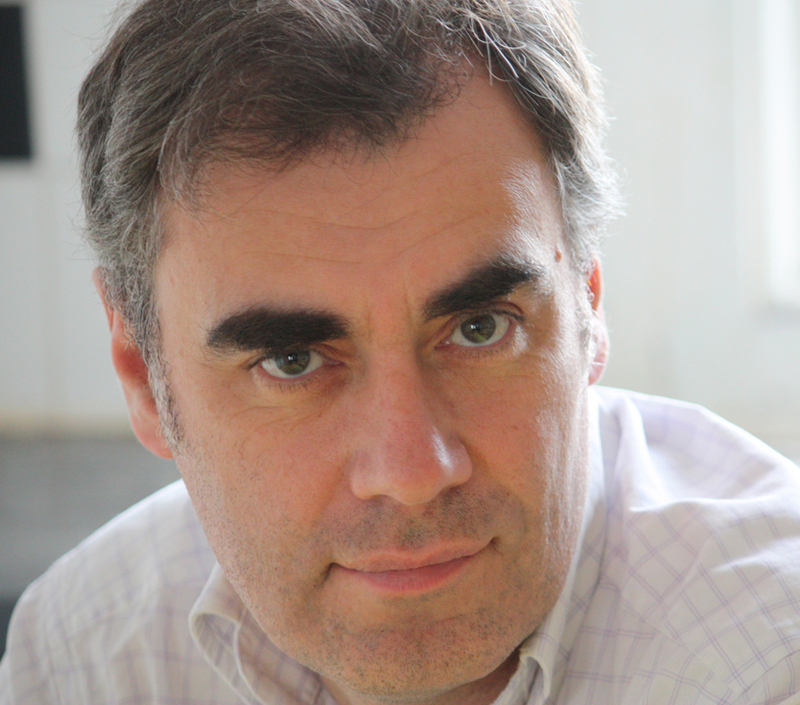 Ian MacQuillin is director of Rogare, the fundraising think tank at Plymouth University’s Hartsook Centre for Sustainable Philanthropy. The ideological attack on fundraising, Part 1 – happenstance, coincidence, or enemy action? The ideological attack on fundraising, Part 2 – are you a Voluntarist or a Professionalist? The ideological attack on fundraising, Part 3 – Why we need an ideological defence. JustGiving’s response to the Daily Mail.